It was really easy to do! Most watches have little spring-loaded pegs that you can remove and replace easily. The watch bands I had used little metal pieces that were bent down to hold the watch head in (see photo), so I just lifted them with my fingernail(yes, I did break a nail! ), removed the head, and pressed them back down with pliers. 2) Then you'll need to decide what to put between them. 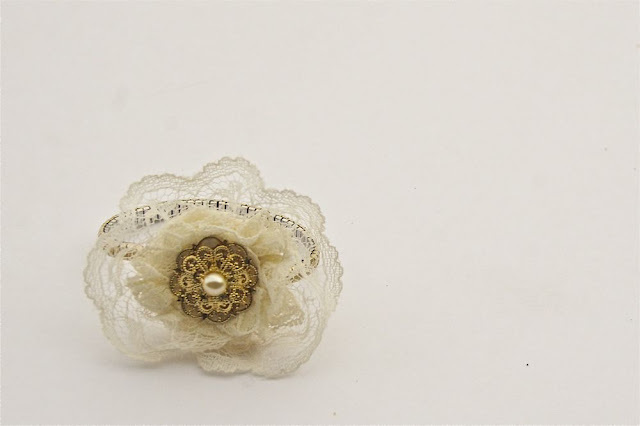 I chose to make a little flower out of lace, by laying two different pieces of lace (13" of each) on top of each other and sewing a long strait stitch, then pulling the top thread to gather. 3) When it was gathered to my satisfaction, I stitched it a few times with my machine to hold it in place. 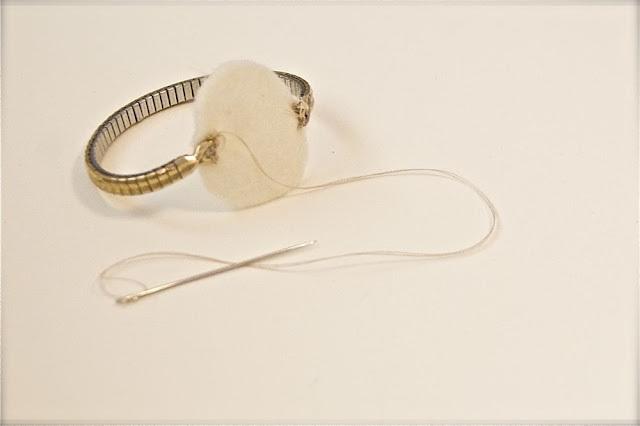 4) Then I used a needle and thread to attach the loops of my watch band to a small circle of felt. If your watch band doesn't have loops you can just sew tightly all the way around one of the links several times, and it should hold nicely. 5) Then I stitched my flower (hot glue would be just fine, too!) to another felt circle the same size, and glued the circles together with my glue gun. 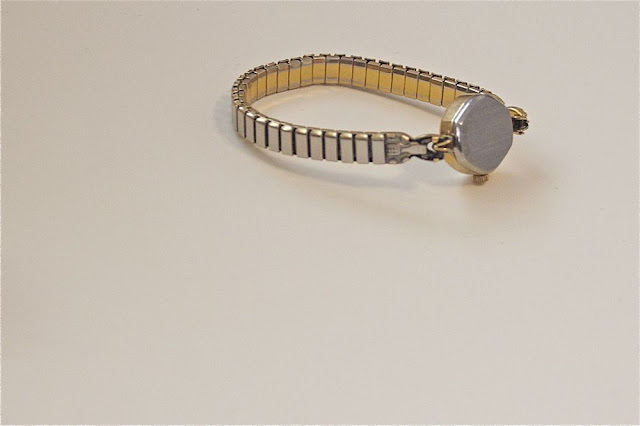 This way the edges of your watch band are tucked neatly between the felt circles. 6) I also glued on a flower and pearl that I rescued from an old piece of costume jewelry that didn't get much wear. 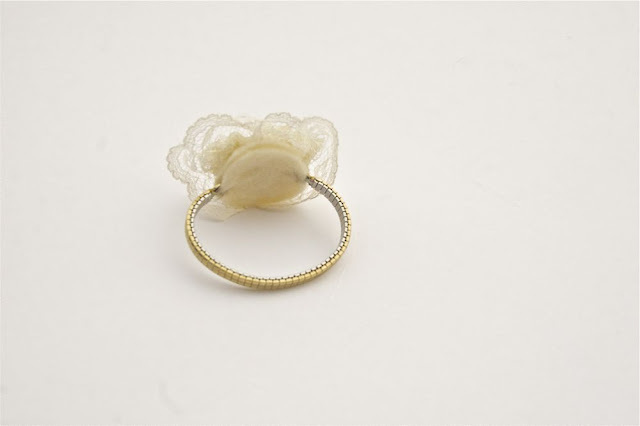 A button would be cute, too, or just the plain flower looks lovely! Of course, you could use any type of watch band, I just happened to have the stretchy kind. I'm not sure why I used an "S" button, as I don't really know any "S"'s that I could give it to. I think I just really wanted to use one of these buttons for something! Anyone want an "S" bracelet?? I have a few more of those buttons that I could send along with it, too. I'll just send it the first person who emails me (you can find my address on the contact page up top) * EDITED: Wow, I didn't think so many people would want that! And you guys are fast, too! Thanks to Liza, who was my first emailer! I'll have it out to you today! i heart the s bracelet and i need an "s". i'll shoot an email your way! I don't understand how you keep coming up with so many good ideas! I can see you designing for Anthropologie, or starting your own company. Those are both really adorable! You're so clever! I have a few old watchbands sitting in my jewelry box, I'll have to try that! I wish I knew what to do with some "S" buttons, but... I don't. Love this It would be a perfect birthday gift for my sister! Hope I was the first to email! Thanks for all your inspiration! Oh my GOSH! That silver 'S' one is SOOOOOOOOOOOOOO CUTE! I love love love it! And my last name begins with an 'S'. Disney, you are just too creative and lovely to put into words! I just wanted to say what I've been thinking for ages now... You are amazing. I love everything you make! So inspiring! Now I can't wait to try this out! What a brilliant idea! 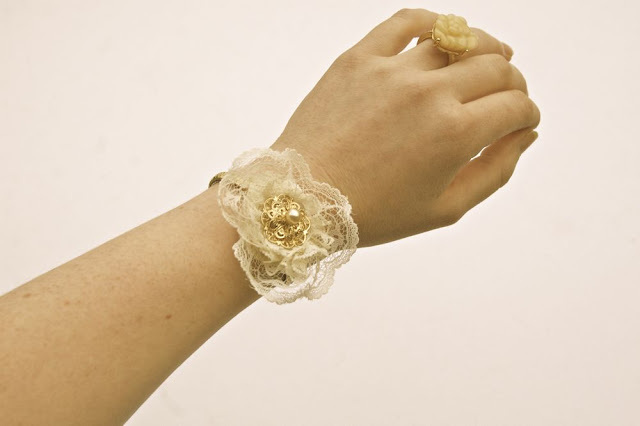 I really love the first one, the gold with the lace make a perfect mix of classy and girly. Thanks for posting this! OMG I love them! 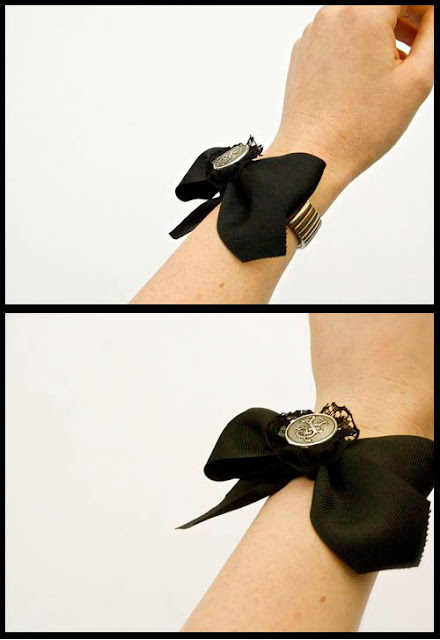 Now that's inspiration for me to find an old watch band at the thrift store or something and make 1 of these. Seriously, you are so creative! I was telling my husband about your blog when I first discovered it and wishing that I could be so original and creative. You inspire! great ideas, I made on by myself because I saw smoething like that on Marie Claire´s magazine. Great job. oooh I work part time in a watch shop so getting bands is an easy task! I had never thought to do this though. Just a tip if you find a metal watch band it is a little dirty... Soak in One party cloudy amonia (or dishwashing detergent)and ten parts warm water for about ten min and then scrub with an old toothbrush making sure to stretch the links open and get into to inside of the band. Then polish with a soft cloth. I will be definately trying this out! I literally want to use your ideas every single day! Wonderful! Thanks for sharing! Ingenious! I think I am going to make some of these for the girls for Valentine's Day. this is SO cool. I run across vintage watches ALL the time thrifting (of course now I said that watch I wont find any LOL ) but Im stoked to find some now! Yep, pure genius! I'm not the best at coming up with new ideas, but I can always see something someone else has thought up and make one myself. I get creative with the remake, but the idea itself - you're great! What a great idea!! Thanks so much for sharing - you are so creative!! 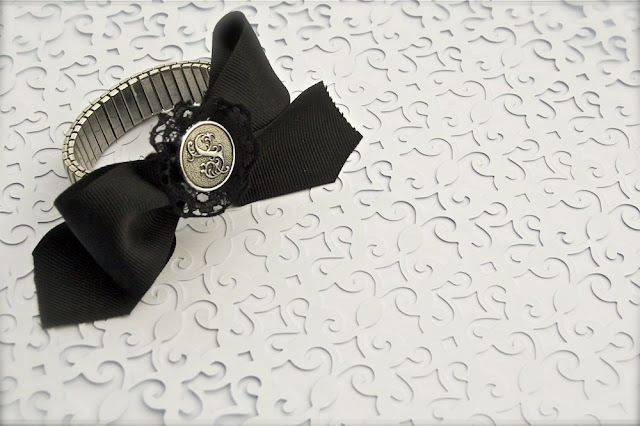 I love the black ribbon bracelet! I posted a link to this tutorial on my blog. Its fantastic, thank you! So creative and beautiful! Wow-wee!!! So stinkin' cute! My dad gave me his old watch on Christmas since he got a new one. I was going to use the watch face for a necklace. So nice to know that I can use the band now too! Thanks for the clear instructions. Whoa...that is such a great idea! I have TONS of these bands. I bought a big both of broken watches in ebay while back. I wanted all of the tiny watch parts to use in art projects. Now I can make some bracelets! Thanks so much for the creative idea, I'll be linking. wow that's a awesome idea; you are wonderful that's for sure. Love this!! Will have to try it for the next birthday! I just love your blog! You have such cute ideas and the site is so "ruffly". Even though I'm a grown woman (57) I still consider myself a girly girl and love all things frilly and lacy. I really need to start my own blog since I am unemployed and love to create. Keep up all your pretty things! I really love this. You always have the greatest ideas!!!! 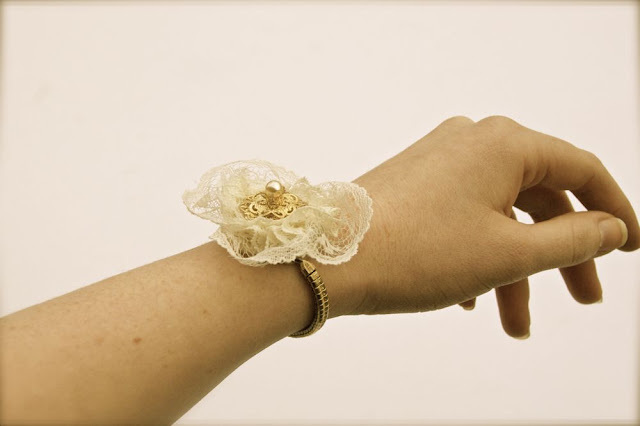 beautiful, i happened to have old, non functioning watch similar to the one with lace, so i bought some white lace and tried... i didnt dare to remove the face so my version is a bit bulkier and my lace seems also a bit bulkier, but all in all i am satisfied. 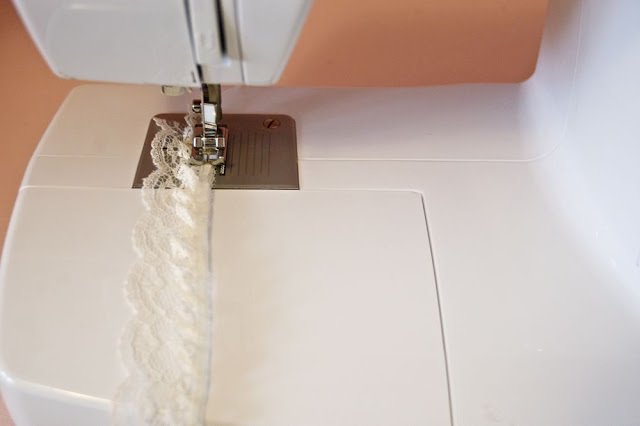 i can always unstich and remove the face or try to rearrange lace.thanks for the idea.